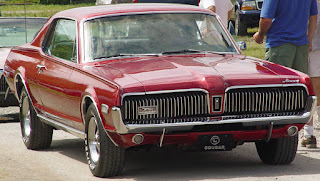 Muscle Car of the Week: 1967 Mercury Cougar! This week we’re gonna take a look at a car we see a lot in our auto restoration shop, the 1967 Mercury Cougar. Based on the ford Mustang, the Cougar was very popular when it debuted, selling over 150,000 in its flagship year. In fact, Motor Trend Magazine named it the Car of the Year for ’67. Aesthetically, the Cougar looked a lot like the Mustang. There were a few major differences though. For one thing the wheel base was a good 3 inches longer which added some stability on the road. In addition, it also featured a brand new front grill with a vertical chrome pattern that some enthusiasts dubbed “the electric shaver grill”. The hideaway headlamps were set back into the grill giving it a very distinctive look. If style is a major factor in your auto restoration decision then you may definitely want to opt for the Cougar. Where the Mustang was available in two and four door options, the Cougar came in only the coupe model. There wasn’t even a convertible upgrade optional. There were, however, three engine sizes to pick from. The biggest of these was the 390 CID Maruader GT engine which delivered 320 horsepower. These numbers hold up today under modern chassis dyno tuning standards as well. In 1967, you could get a brand new Mercury Cougar for just under $3000. A quick search of the internet auction sites says you can find them fully restored for any where from $10,000 to $27,000. Muscle Car of the Week: ’70 Coronet Super Bee! 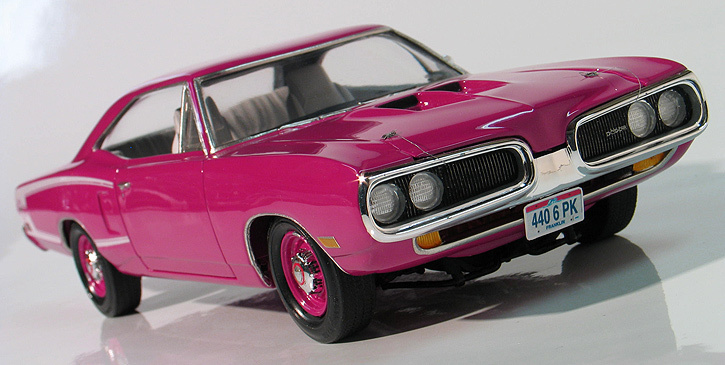 Highly sought after in the auto restoration community among eccentric collectors, the 1970 Super Bee is a real prize if you can find one these days. This is especially true if you can find it in the series premiere color, Panther Pink! They only had 39 orders that went out in this shade so you can see why it’s so rare. One feature that made the Coronet stand our from the pony car pack of the early 70’s was it’s radical new front end design that consisted of a twin-looped front bumper that Dodge Public Relations referred to as “bumble bee wings”. The face lift Dodge put on the Coronet that year is a testament that new and different don’t always correspond to more sales in the auto industry, though. From 1969-1970, sales plummeted from around 15,000 units to just about 5,000, leading to the end of it’s production a year later. The good news is that these low sales numbers are exactly what makes the Super Bee such a gem for enthusiasts of classic car restoration in Los Angeles and throughout California- and the rest of the States for that matter! Enough about history though, we know you come to a muscle car restoration blog mainly to hear about the STATS, right? 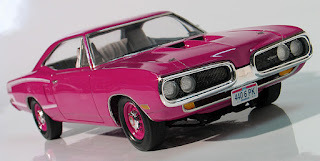 The Super Bee came with three different engine options, the ballsiest of which being the 426 Hemi that pumped out around 425 horsepower. The original cost of the ’70 Coronet Super Bee was just over $3,000. Today, the fully restored ones we’ve seen at auction all go for around the $25,000 price tag. 1974 was a sad year for muscle cars. It was the year that Dodge discontinued one of it’s trademark autos, the Challenger. Despite it’s limited production (only 16,000 made) we still see a good amount of them here at our classics restoration shop and around the Southern California car show circuit. This is probably because the car itself is actually pretty great. For starters, it was one of the best looking cars of the time period. With it’s upgraded body side louvers, tape stripes, and a sportier instrument cluster, the Challenger was a sleek and stylish pony car that still managed to look imposing. There was no six cylinder option in 1974, but the car was still not as powerful as most of it’s competition. In fact, the standard engine in the Challenger, a 360 cubic inch V8, only produced around 245 horse power. 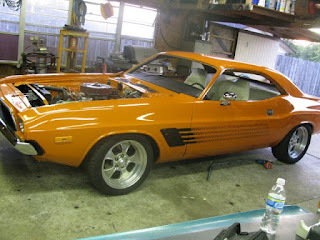 For this reason, a lot of people that choose the ’74 Challenger for their muscle car refurbishment project opt to put in a larger larger one like a Hemi. The real reason the Challenger failed, however, wasn’t because of it’s lack of balls. New insurance and emissions regulations scared away many money-conscious consumers. In addition, there was an oil crisis that led people to look for options with better mpg ratings. Despite these apparent negatives the ’74 Challenger is still a great auto restoration choice. We’ve seen fully restored ones on auction for up to $28,000. 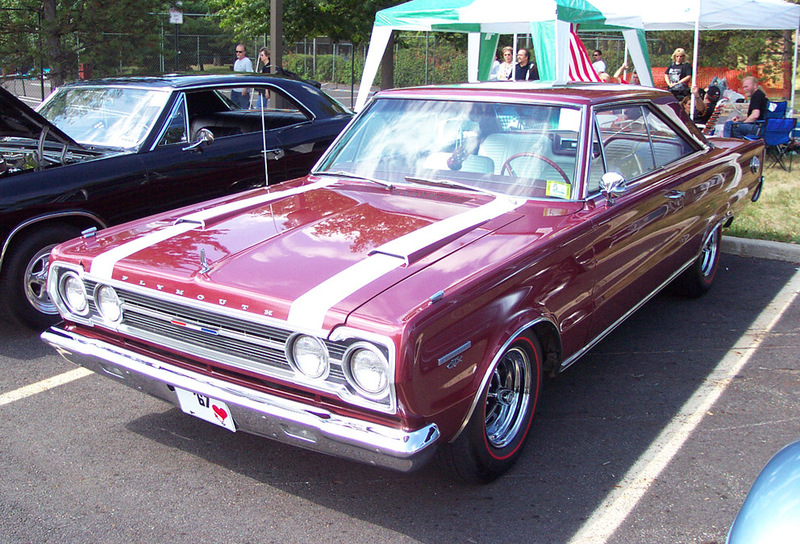 Today we’re featuring the 1967 Plymouth GTX! We have some first hand experience with this car because one of the mechanics at our auto restoration shop here in Los Angeles actually restored one for himself in 2009! Known as the ‘Belvedere’ in most hot rod restoration circles, because of it was considered the ‘gentleman’s muscle car’, it was officially titled the GTX by Plymouth in ’67 because of some big time changes. One of these changes was a complete cosmetic makeover. They added hood scoops, special grill, new ‘Red Streak’ tires, and even racing stripes. There were two engine options available. The first was a 440 cubic inch V8 Super Commando that boasted quarter mile speeds in the 14 second range. That one delivered 375 horsepower. The second one was the Plymouth’s classic 426 cubic inch Hemi- often called the ‘elephant’ by car enthusiasts of the day. This thing made the GTX go from 0-60 in 4.8 seconds and the quarter mile in 13. We had one our mechanic’s in for a chassis dyno tuning not too long ago and found out that it kicked out almost 440 horsepower and 473 lbs-ft of torque! Our guy bought his on an internet auction for $1500 and had it appraised after restoration for $18K!